From our grandmother, Hilda Dorman. A family favorite featured in our own family cookbook. This classic Shrimp & Grits recipe can be found on the back of every grits bag we produce here at Palmetto Farms. 2Bring chicken broth and milk to boil in a medium saucepan. 3Stir in grits and salt, return to boil. Cover and reduce heat to low. 4Cook 20-25 minutes, stirring occasionally. Stir in cheese. Keep warm. 7Cook diced bacon in pan until crisp. Remove bacon and drain all but 2 tbsp. of fat. 8Add peppers and onions to pan. Cook until tender. 9Add cleaned shrimp and cook until pink. 11Stir in hot pepper sauce, salt and pepper to taste. 12Serve shrimp mixture over warm grits. Garnish with green onions and cheese. This is the best shrimp and grits I’ve ever eaten! I love to make it for family and friends. 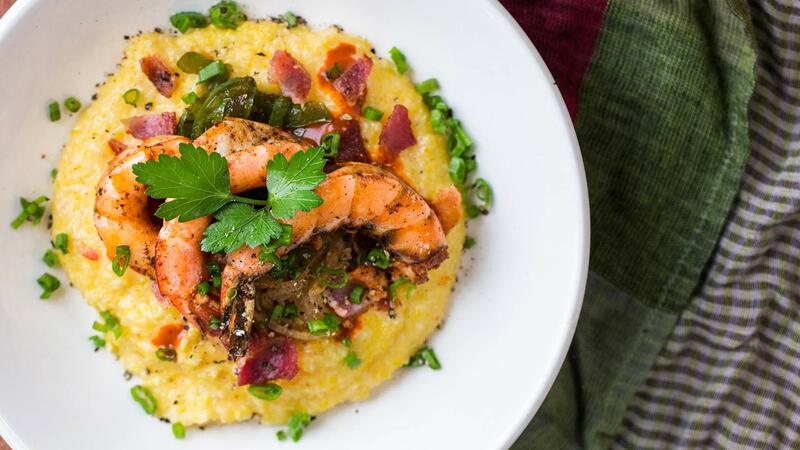 This is our go-to shrimp and grits recipe. The grits are just the right texture and the dish is absolutely delicious!